Taken 1911 at Works on Via Gellia, near Slaley. Wheel hub probably reads: "Marshall, Sons & Co Gainsborough"
This tractor was probably made at Britannia Works, before 1911. Recently I've been going through some pictures with my mother in law (she's a Bunting from Bonsall). She came up with this Post card. The Man in the forefront is her grandfather Daniel Bunting born abt 1859 married to Selina Richards with children Esther 1882 - 1957,Joseph 1883 - ? Martha Ellen 1886 - 1969 Later in life they lived in the Via Gellia in a house opposite "The Colour works" where he worked. This house is no longer standing, but the Colour works has been converted into a dwelling. 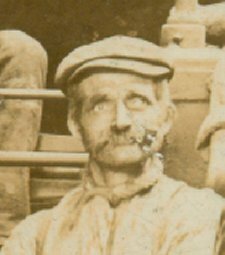 Daniel Bunting can be traced in the Census for: 1901, 1891, 1871 and 1861. 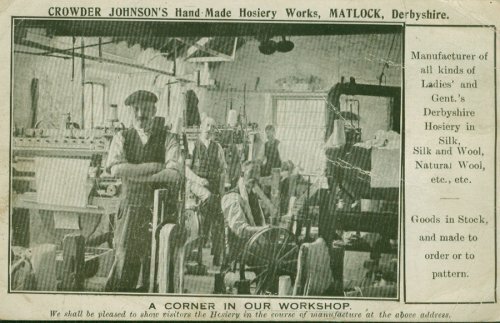 Thomas Crowder Johnson, hosiery manufacturer of Matlock Bank, can be traced in the Census for: 1901 and 1891. Found another picture for your web site. The picture is of an engine, sorry I do not know what sort but on the "barrel" it says 1911, on the wheel boss it says Gainsborough. 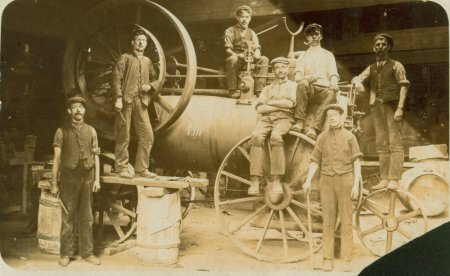 There are men standing or sitting arround and even on the engine. I think the engine may have been in a workshop a little way up the Via Gellia from Bonsall, (my white peak map shows "works" directly below Slaley I think, that, that is, the workshop.) 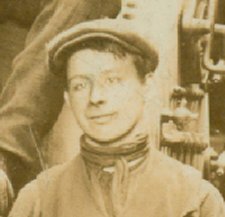 The man sat on the wheel is Daniel Bunting (Bonsall 1859-1933). 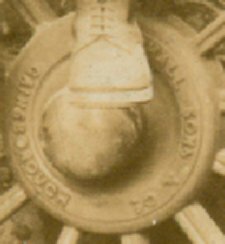 Standing in front of the wheel with a stick in his hand is Joseph his son (born 1883 Bonsall). the remaining men are unknown. Daniel and his family lived in a cottage directly across the road from the "works" until after Selina's (his wife) death in 1934. The cottage was demolished in the 1980's. I have sent you a picture of Daniel at work before, it is picture 366 on your site. Daniel appears to be wearing the same hat in both pictures, but in this picture he is smoking a clay pipe as are 2 of the other men.